Crossing the Brooklyn Bridge is an NYC experience to remember. Make the most of your walk across the iconic span. 1. Prep for a trek and wear sensible shoes. It's just over a mile across the bridge (and double that if you opt to walk it both ways), and with the near-always-busy crowds, don't count on being able to take a break on one of the coveted bridge-top benches. Do leave the heels behind—you'll have plenty of places to wear those out on the town in Manhattan—and opt instead for comfortable footwear. 2. Stay in your lane. The elevated promenade is shared between cyclists and pedestrians, with only a painted white line to separate the two designated lanes. Be mindful of one another. Many cyclists use this path for both commuting and pleasure rides, and, speaking from experience, it's unfairly frustrating to them when pedestrians so frequently wander into their designated route. More importantly, it's potentially quite dangerous! 3. Factor in plenty of time. While the bridge is possible to cross via a 25- to 30-minute walk if you're briskly pushing through it, the trip can easily take closer to an hour if you stop for photos, conversation, and to enjoy the views. 4. Consider starting on the Brooklyn side. 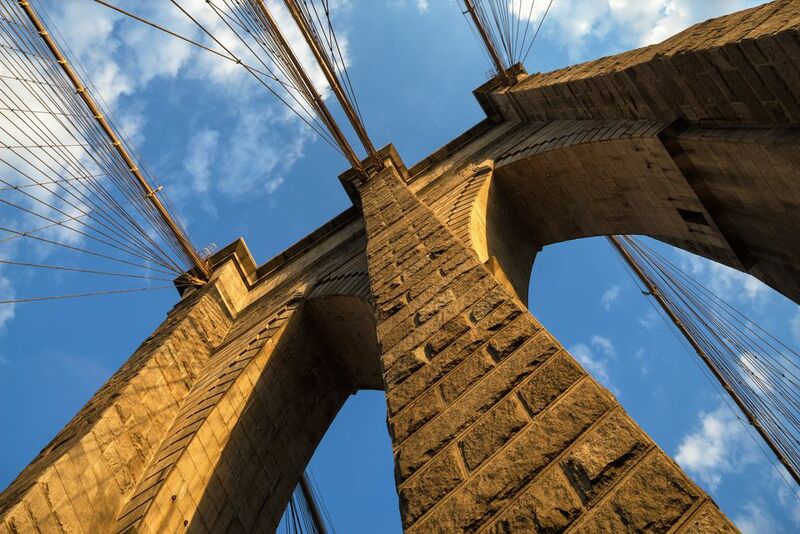 While access to the Brooklyn Bridge is an absolute breeze from the Manhattan side, many prefer to take the subway across to Brooklyn and work their way over the bridge in the direction of Manhattan. This way, you'll have Manhattan's dramatic skyline fronting your approach for the entirety of the walk. 5. Prepare for the elements. When it's very cold, rainy, or windy, you're sure to feel it even more so on the bridge, with no cover and wind gusts coming off of the river and harbor below. You'll enjoy the walk much more when the weather is cooperating. On the opposite side of the coin, on a hot day, keep in mind that there's no real shade to be had—be sure to bring a hat, sunscreen, and enough water to stay hydrated. 6. Plan ahead for food, drink, and bathroom breaks. On the note of water, keep in mind that there are no food or drink vendors or toilets situated on top of the Brooklyn Bridge—be sure to plan your provisions and restroom stops accordingly. 7. Sunrise, sunset. Walking over the Brooklyn Bridge is beautiful by day or night, but a sunset stroll is exceptional for the atmospheric lighting, and for the opportunity to observe the scene by both daylight and under nighttime's twinkling lights. Early birds get the view largely to themselves, however—wake up for a sunrise walk for beautiful colors and much less congestion. 8. Don't miss the attractions on either end of the bridge. Just across from the Manhattan-side entrance to the Brooklyn Bridge is the pretty little City Hall Park, brimming with history and fringed by notable landmark buildings, like the Woolworth Building—be sure to make some time to take it in. Also, don't overlook the attractions on the Brooklyn side of the bridge, including the great little neighborhoods of DUMBO and Brooklyn Heights, and the fantastic, newly developed Brooklyn Bridge Park. 9. Read up on the bridge's history and surrounding sights (or consider a guided tour). You'll get much more out of your walk if you know what you're looking at. Check out A Guide to Manhattan's Bridges: Brooklyn Bridge for more about the bridge's history and impressive statistics. Be sure, too, to look out for the historical plaques and bronze panoramas installed along the bridge route to help enlighten your surroundings along the way. Alternatively, consider setting out on a tour with a knowledgeable guide (like this one, from my walking tour company, BQE Tours) to gain insight into fascinating bridge facts and stories that you might otherwise miss.